Personalised Celtic Titanium Ring : LOVE2HAVE in the UK! This particular titanium ring is our personalised Celtic ring. The best sellers on our site are the personalised titanium rings bought for special occasions like weddings and also the Celtic titanium rings. 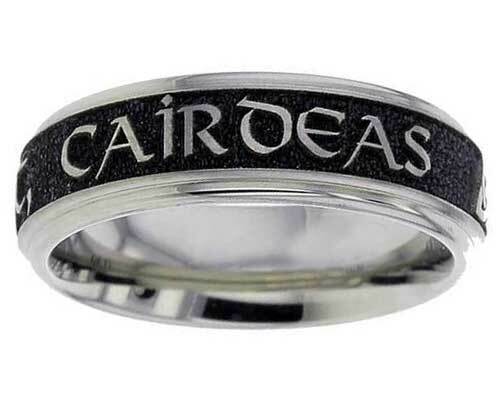 The Celtic rings are hugely popular we tend to find, and there is a massive demand for all things Celtic still from customers all over the world. This ring combines all of those above in that it is Celtic in design and allows you to choose your very own Celtic personalised engraving too. If you are a real lover of all things Celtic and want something special just for you that stands out from the rest, then this is the ring for you. As pictured the designer has chosen a lovely Celtic font that wraps itself around the outer of the ring. The design also features the Trinity knot Celtic symbol too. The profiling of the ring is flat with a slight shoulder on the edging. The darker areas of the engraving have a pitting which we think adds an ancient feel to the design. The overall finish is polished, which again looks the best in our opinion, but you can have satin if you wish. When ordering, to specify the engraving you want, please enter this information into the comments box at check out. The personalised Celtic engraving included in the price is FREE! Returns Policy: This UK made titanium Celtic ring is personalised and made to order so, therefore, non-returnable unless faulty or not as described. Please see our terms and conditions.